Liturgy matters not because it ought to matter but because it simply does. This means it shouldn’t be trivialized and made into a bad joke by clergy dressed up as clowns, always sinister, or by silly dancers and frightening mimes. You’d think it was obvious: don’t hold a Clown Mass, it’s goofy and you’ll scare everyone; step away from the interpretive liturgical dance, it looks weird and dumb; no more mimes, they’re badly wrong. Obviously. Well you’d think so, but tell that to the next Cardinal who sits behind his plywood Altar pretending to grin at the antics of a troupe of dancing nuns, or the worship team at Holy Trinity, Wall Street, as they roll-out their next under-the-big-top Eucharist. 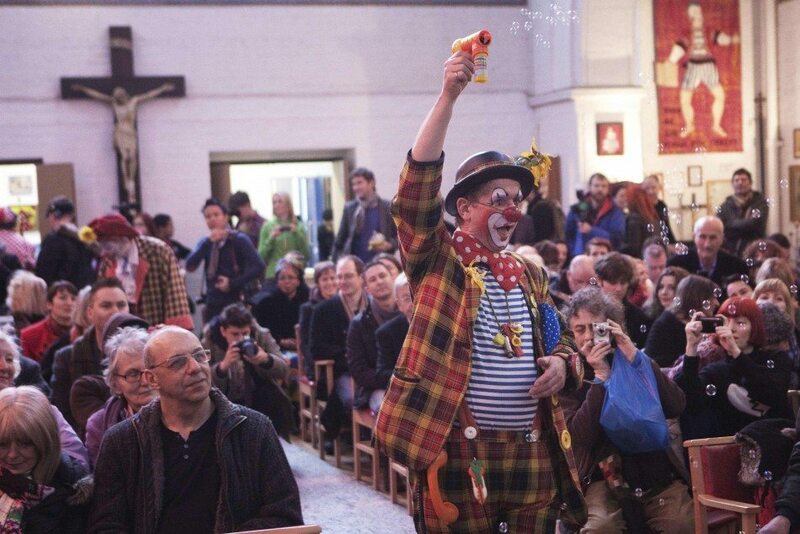 The point’s simple, clowning about with the liturgy makes a mockery of the worship of God. Unfortunately, the practice is more widespread that you might think. Chaotic, disordered, frenzied, and spontaneous worship produces clowns, even if the make-up, big red noses, and oversized shoes are lacking. The apparently tame practice of celebrating versus populum (towards the people) is really a joke. This isn’t simply to say that some people don’t like it but to recognize what it conjures up in the mind. Think about it, the priest assumes the role of a late night T.V. host, like David Letterman, Jimmy Kimmel, Jay Leno, Conan O’Brien, maybe even Jack Parr. There he is, standing or sitting behind the “desk” and he’s going to entertain an audience. Alright, maybe the clergyperson’s opening monologue isn’t really funny, often they aren’t, but this is the expectation raised and of course the priest has to learn his moves. He has to make eye-contact, engage the audience and let everyone know he’s just “one of them.” Above all, he has to hold the people’s attention; priest and people face each other, the one to entertain, the other to be entertained. He was right, when the worship of God is turned into a variant of an after-hours talk show, or stand-up comedy, then everything else follows. Some of us may remember that the liturgy didn’t use to be this way, until “experts”, our friends the “liturgists”, persuaded the Church that antiquity and therefore authenticity were on their side. We have to say Mass facing the people, they argued, because the early Church did it that way. Except, we’ve discovered, that it didn’t and Fr. Aidan Nichols in Looking at the Liturgy: A Critical View of Its Contemporary Form (Ignatius 1996), points out that liturgical change has always claimed antiquity as its first principle but finally relevance as its one and only principle. Nichols is right, now that we’ve discovered that versus populum isn’t backed by the practice of the first few centuries of Christianity, we discover that its defenders aren’t referring to that anyway. The early Church should have celebrated the Eucharist a la David Letterman. Clericalism, you say. No. Clericalism is the goofy guy behind the desk, with all eyes upon him. But a priest is just a priest with eyes only for Jesus and His Cross. Malleus is an Anglican priest, living south of the Mason-Dixon.